Horses are incredibly instructive personalities for humans for several reasons, Landolphi explained to Devin, our Content Leader, and I before we began our retreat. “Dogs are wonderful, therapeutic animals that make you feel good because they want to please you. They are codependent that way! 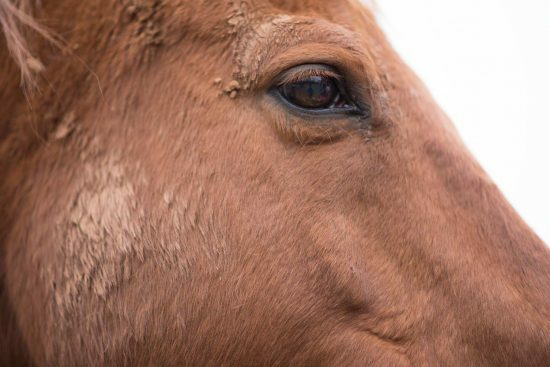 Horses are not codependent.” Because horses’ primary concern is safety, as herd animals they respond to other animals in a way that keeps them in line with the pack. That allows them not to mirror us as humans, but to let us know what energy we are giving off. “Your insides have to match your outsides for a horse to feel safe with you,” Suzi said to our group of 12 caregiver spouses. Suzi asked us all to work on being present in the moment, and when we did, the horses began to look at us more closely. “It’s just a coincidence,” she said. When one spouse needed support, a horse walked over to her and put his nose on her shoulder. “But it’s just a coincidence,” she said. When another stood tall and asserted herself as a leader, the horse followed. “It’s just a coincidence,” we chorused with her. Other times, we would have to step into the horse’s space and change our energy to match his. When we did, the horse calmed. Just a coincidence? The whole weekend felt like that, one moment after another. I watched each person at the retreat, our team members included, be fully present in the moment and when they were, magic followed. I saw one team member dance for the first time at a retreat, a participant fearlessly fling herself upside down into a handstand against a tree at an alarming angle, and countless other amazing moments that I’ll keep in our quiet little community. What a simple lesson, though, about how much change we can affect in ourselves just by noticing what already is. Leave it to a couple of horses to teach us how to be fully human.